The A-10 and OA-10 Thunderbolt IIs are the first Air Force aircraft specially designed for close air support of ground forces. These aircraft are simple, effective and survivable twin-engine jet aircraft that can be used against all ground targets. The first production A-10A was delivered to Davis-Monthan AFB, in October 1975. It was designed specially for the close air support mission and had the ability to combine large military loads, long loiter and wide combat radius, which proved to be vital assets to America and its allies during Operation Desert Storm. 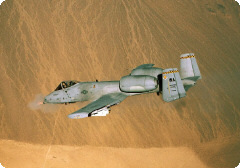 The A-10 has excellent maneuverability at low air speeds and altitude, and are highly accurate when delivering weapons. They are capable of loitering near battle areas for extended periods of time and operate under 1,000 foot ceilings with 1.5 mile visibility. Their wide combat radius and short takeoff and landing capability allow operations in and out of locations near front lines. With the use of night vision goggles, A-10 pilots can conduct their missions during darkness. A-10s are equipped with Night Vision Imaging Systems, compatible single-seat cockpits forward of their wings and a large bubble canopy which provides pilots all-around vision. The pilots are encircled by titanium armor that also protects parts of the flight-control system. The redundant primary structural sections allow the aircraft to enjoy better survivability during close air support than did previous aircraft. Their self-sealing fuel cells are protected by internal and external foam. Their redundant hydraulic flight-control systems are backed up by manual systems. This permits pilots to fly and land when hydraulic power is lost. The Thunderbolt II can be serviced and operated from bases with limited facilities near battle areas since many of the aircraft's parts are interchangeable, left and right. The A-10's avionics equipment includes communications, inertial navigation systems, fire control and weapons delivery systems, target penetration aids and night vision goggles. Their weapons delivery systems include head-up displays that indicate airspeed, altitude and dive angle on the windscreen, a low altitude safety and targeting enhancement system (LASTE) which provides constantly computing impact point freefall ordnance delivery; and Pave Penny laser-tracking pods under the fuselage. The aircraft also have armament control panels, and infrared and electronic countermeasures to handle surface-to-air-missile threats. Page rendered on 25 April 2019 at 00:00:25 in 393.867 microseconds.